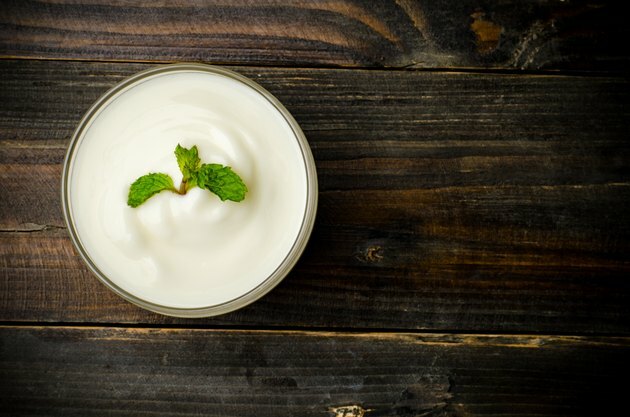 Probiotics are microorganisms that can improve your health when you take them in the right amounts, the National Center for Complementary and Alternative Medicine explains. Most probiotics are bacteria, because the body naturally contains bacteria in the intestines. Two commonly used probiotic bacteria are Lactobacillus and Bifidobacteria, and they can be used for a variety of health problems. Lactobacillus acidophilus bacteria are the most commonly used probiotic supplement, the University of Maryland Medical Center reports. These bacteria can be found in some supplements and milk that has been enriched with acidophilus bacteria. Lactobacillus acidophilus bacteria are naturally present in some foods, such as yogurt with active cultures, tempeh and miso. The bacteria are typically cultured in milk or other dairy products and are sometimes freeze-dried into powder or capsules, which makes them easier to transport. Bifidobacteria are another commonly used bacterial probiotic. Much like Lactobacillus acidophilus, these foods are often cultured in milk-based condition. Bifidobacteria can also be found in sauerkraut. Bifidobacteria supplements can be taken on their own, but they are often combined with other probiotic strains of bacteria, such as Lactobacillus acidophilus, which helps increase the diversity of the bacteria in the intestines. There are a number of different species of bacteria in the Bifidobacteria family, including B. longus and B infantis. Probiotics are often used after a course of antibiotics. The intestines contain bacteria that help prevent infectious bacteria from colonizing the digestive tract by taking up space and resources. When you take antibiotics, the drugs kill both infectious and healthy bacteria. This can allow harmful bacteria to thrive in the intestines, resulting in diarrhea. Acidophilus or Bifidobacteria supplements can help prevent this. These bacteria can also aid in keeping the immune system strong and help with digestion. In general, probiotics are safe for people to use, though you should always check with your doctor before beginning a new supplement. Probiotics can be dangerous for people with weakened immune systems, which can occur due to long-term use of corticosteroids, an HIV/AIDS infection or organ transplants. You may also need to avoid probiotic supplements if you have an artificial heart valve; in rare cases, these bacteria can infect your heart muscle, and patients with artificial valves have an increased risk of this complication.